Safely and conveniently control your garbage disposal with one easy-to-install button! Presair’s air switch for garbage disposal is a safe alternative compared to a wall mounted electrical switch. Using pneumatic technology the operator does not risk electrical shock as their is no electrical current at the point of actuation. 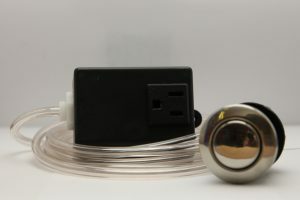 The air switch for garbage disposal easily mounts to the sink, counter top, or the wall when paired with a plate. The air switch is compatible with most garbage disposals. 1. Mount air button – To mount on counter top, 1 ¼” hole in counter top. Place button into hole and tighten with plastic nut from below counter. To mount air button on sink top, use hole for sprayer or soap dispenser. Place button into hole and tighten with plastic nut from below sink. 2. Attach one end of the air tubing supplied to bottom of the button and the other end to the white air spout on the black converter box. Note: Air tube can be cut to length as necessary. 3. Plug the converter box into three-prong grounded outlet. 4. Plug your garbage disposal into the converter box. The air switch for garbage disposal is easy to operate. To start the disposal, simply press the air button. If the momentary air switch was chosen, release the button to shut off. If the latching (maintained) air switch was chosen, press and release the air button a second time to stop the disposal. Maximum Ratings: 15 AMPS, 125 VAC. Use this product only within the rating, and in accordance with national and local electrical codes. For more information or a printable guide, view the how to below. To purchase an air switch for garbage disposal, visit our online store or contact us.